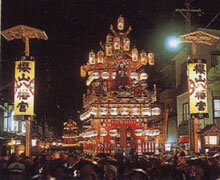 with Gion Matsuri (Gion Festival , Kyoto) and Chichibu-Yomatsuri (Night Festival in Chichibu, Saitama Pref.). are carried through the streets. They are just like a moving art museum. You can buy the ticket from 10:00a.m. one month and one day before on that day. JR station, major travel agencies. You can book a seat by 7:00p.m. one day before the day.